Xmas Single Launch Party! ft Oh!Gunquit, Green Seagull & more..
Xmas Single Launch Party with OH! 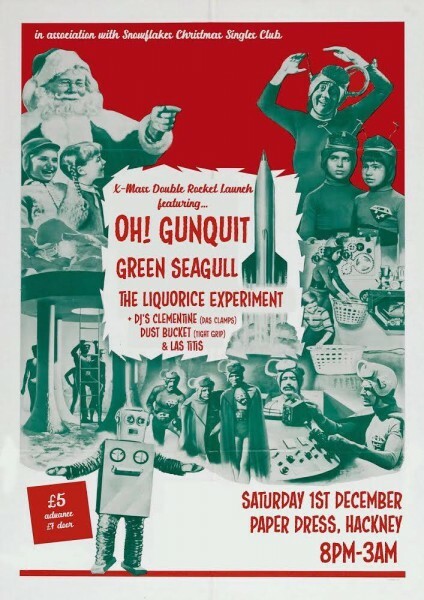 GUNQUIT, GREEN SEAGULL, THE LIQUORICE EXPERIMENT live plus DJ’s Clementine (Das Clamps), Dust Bucket (Tight Grip) & Las Titis…! We’ll be doing a bring your own Wrap-a-Present-Swap of something you wanna rid yourself of and burden someone else with.. (one man’s trash is another man’s treasure! )……So come for a smashin’ single releasing xmas dooo – full of Holiday Jeer! Spread the word – Facebook event page here!